Do you or would you use a tablet for actual work? So, with the updates to iOS 11, it seems that Apple is finally gearing up to put the “Pro” in iPad Pro. And yes, while thus far the machine was really powerful, fast, and gorgeous-looking, its issues with multitasking and the barred-off nature of iOS definitely didn't lend towards a good working experience with the tablet. Unless you are a sketch artist who only uses one or two apps, for example, the Pro felt jarring. But it's not the only tablet out there that's geared towards professionals. 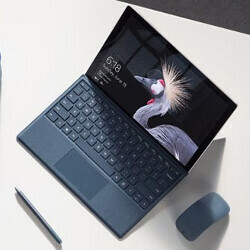 Microsoft's Surface Pro is now 5 generations old and it has its fair share of devout followers, albeit in a tight niche. It's a tablet with PC-grade hardware, a full version of Windows 10 on board, and its own set of removable keyboard and active stylus. And then we have the Huawei MateBook, Samsung Galaxy TabPro S, HP Spectre, and tons more “work tablet” type solutions, covering different power tiers and price ranges. But the question we'd like to ask is: would you use such a device? Or is it still too early for tablets to be viable working machines and desktop / laptop is still the way to go? Do you or would you use a tablet for work? Nope, that wouldn't work out for me. Anything in Journalism would work. Surface pro 4. One screen and one hub in my office. I arrive in the morning, plug to the hub and voila! Depends on what kind of work tbh and even at that the Surface (pro) tablets should always be the device of choice. Other tablets are just glorified phones at this point. Outside of mouse support, I think the iPad could work for most task with iOS 11. I would actually need to dock it and set up multiple screens though. The tablet itself would be fine on the go. I think Phone Arena just lost their pass for the next Apple event. Writing the truth about Apple's "pro" labeled products like that. Only if it was a Windows pro tablet, nothing else is practical Even with a tablet a dock is needed for Proper keyboard & external monitor. If it runs on windows 10 and has decent specs I definitely would. Other platforms are just for web surfing, mobile gaming and multimedia consumption nothing else. All my shipping/receiving reports and all my machine inspection reports. The field service techs log books and expenses all run through tablets. My company wants to eventually remove all the laptops from the service trucks and run tablets and have a handful of laptops for programming and advanced diagnostics. Thankfully they are Samsung so we can use Sidesync without having to rely on a 3rd party application. I do my work on a Chromebook, so I don't think that moving to a tablet would be that big of a stretch. Tablets have a lot of potential for business outside the office setting, I have a cozy desk position in a warehouse environment and I would love to develop tools to be used by the warehouse co-workers to assist them in their functions. There's really so much potential for those who know how to develop tools for them. I do everything on my tablet. Hadn't opened my laptop in about a year so gave it to my niece. I use a Surface Pro 4 instead of a laptop and it works brilliantly without any compromise whatsoever. But of course, this is because it runs full-Windows and it also has a 3:2 screen ratio, so the height of the 12" screen is actually similar to the height of a 16:10 ratio, 13.3" laptop. I could not imagine using an iPad for serious work, to be honest. The iOS is not suitable for productivity. I do use an iPad Air 2 for work as part of a pilot program, but not very much. It's really a bad user experience the way they've got it set up. I use it as little as I can. No way. If it's something I can't do on my phone, I'd rather have a laptop to due. I don't do graphic arts or anything like that, so a touchscreen doesn't matter much to me. I tried the tablet thing - can't get into it. My wife has a 2-in-1 Lenovo Windows 10 tablet that's nice, but I find that most formats don't protect the keys when in tablet mode (if not detachable). Acer's about the only one I've seen address this in some models. Most also have compromises in performance I'm not willing to live with. That said, I do appreciate thin and light. I have two laptops I use for work stuff (and fun). I have a thin and light clamshell laptop that's marginally thicker than an HP Spectre but works well for email, web, and even some light VM stuff. It's great for when I'm traveling - I don't have to get the beast's boat anchor of a power cord out. The workhorse is a heavily upgraded MSI GT60 that's a bit old, but still can handle anything I throw at it - especially when I upgraded the graphics to an Nvidia 970m. I never could get into the tablet craze. I've tried multiple times, with both 7" and 10" tablets, and even dinking around with my wife's 11" Lenovo. The Lenovo's the most usable, but I still prefer a laptop for work. I can definitely see the appeal for certain segments and tasks, though. It's just not for me. I'm using one... but i dock it to 2 - 24" monitors! No. Nothing beats a full fledged laptop. Tablets are for media consumption mostly. As long as it runs Windows and has Win32 support (Windows 10s is not yet ready), I don't see why not. Android or iOS are simply unacceptable. I answered "I would...", but the truth is that I do, but not all the time, and not without compromise. It's my road-warrior solution, a compact replacement for my desktop setup when I'm away from my normal workspace. I use an Android tablet in meetings but when I need to do things with Microsoft Office, I use remote desktop to my desktop PC. IOS and Android don't even compare to the surface for work. Surface will do anything a desktop or laptop can. D: I would, but my current job doesn't have a need for it. E: I would, but my current employer doesn't provide one. F: I would, but cost is not right... (?) These are all additional possible answers. I would probably use one - but my employer doesn't give one to use - and it's probably not cost efficient for them to do so. I have an Asus 2 in 1 with detachable keyboard running windows 8.1. I have a MS Office 365 subscription so can use REAL MS programs that actually work. Forget Android and Ios for real work. Android and iOS are play platforms only.